Famous License Plate House - Book Now for Summer! THE BEST POSSIBLE LOCATION!!! 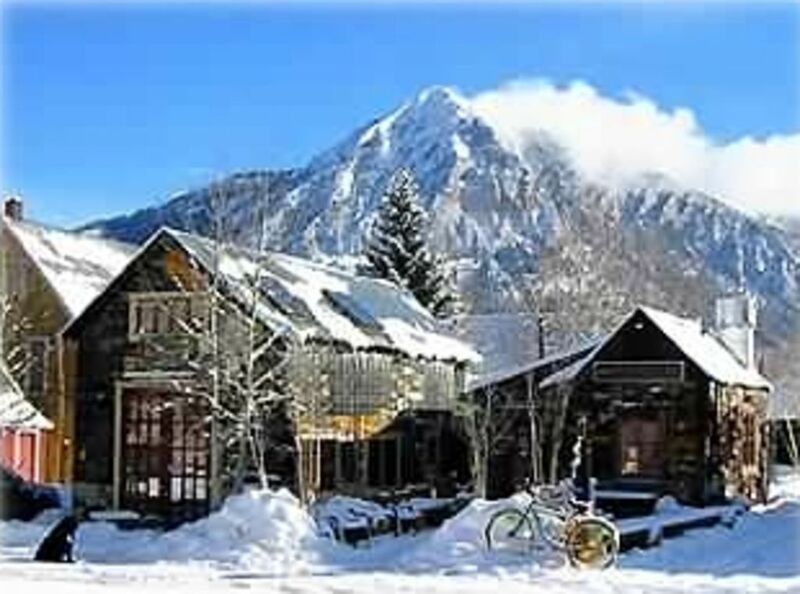 In the heart of downtown Crested Butte, 50 feet from the main street, Elk Avenue and all the best retail and restaurants, and one and one-half blocks from the bus stop to Mount Crested Butte and the Mount Crested Butte Ski Area. With the best local coffee shop right next door, and across the street from the health food store, home made ice cream store and massage studios, this location cannot be beat! Just two blocks from almost every restaurant in town and GREAT people watching. The nicest, two bedroom, two bath, rental home in town, a single family home, not a duplex or a townhouse. Historic building exquisitely renovated in 1993. Complete with 20-foot vaulted ceilings, hardwood floors, two gas-log fireplaces, king memory foam matress in the downstairs bedroom and queen bed in the upstairs bedroom, SUPER comfortable Tempurpedic queen sleeper sofa (no bars or springs), complete kitchen including kitchen Aid and Bosch SS appliances and waffle iron, coffee maker, blender etc. There is also a washer and dryer, two-person Jacuzzi tub, and large tile steam shower. The entertainment center in the living room includes a new (2012) 46' high def/3D flat screen, a CD player, Blu Ray/DVD player/Play Station 3 along with a nine-speaker, surround-sound stereo with volume controls in the master bedroom and master bath. Also in the master bedroom is a new (2014) 40' LED HDTV; the upstairs bedroom has a new (2014) 32' LED HDTV. There is a natural gas BBQ grill just outside your door and an outdoor heater on a large patio for those chilly summer nights or morning coffee on the patio! You will not believe the contrast from the historic and famous exterior to the luxurious interior! Dogs are welcome!!!!! However, please be aware that guests will be required to crate their dog(s) when leaving them unattended at the house. Pet deposit and daily fees apply. The PET DEPOSIT IS REFUNDABLE after inspection. Thank you! All funds (excluding security & pet deposits) sent are non-refundable upon receipt. Robert Hunt is a real estate developer in Colorado and Texas. This is one of the most beautiful places in the United States with low population density and plenty of activities. The home is an easy walk to all the restaurants and shops in town. Charming house, clean and well equipped in a great location. Had a wonderful stay with our dog. We really enjoyed our stay and everything we’d heard about the house was accurate. The location was so convenient that we never needed to use our vehicle during our stay. The house has great character inside and out and I will definitely seek to rent this one again for a future trip to Crested Butte. Spent 4 days in Crested Butte at this house. Lots of unique upgrades with an indoor hot tub. The fireplaces are all thermostat controlled which makes it very easy to manage heating this house. Overall the house is perfect for a long weekend getaway. I do suggest to move the TV Dish boxset because of the heat from the fireplace kept causing the Dish box to turn off because of the heat. We loved the location and amenities. We had a wonderful time staying at the home. The location is great and we appreciated the off street parking during the busy holiday week. Great coffee shop next door and grocery store across the street. House was very clean and included nice amenities such as whirlpool tub and steam shower which came in handy after the days on the slopes. Home was very comfortable and quiet for being so close to the main downtown area. Highly recommend. Well kept and unique home, wonderfully convenient location, and accommodating hosts. I would happily come back again! We enjoyed our time here. This home is adorable. It is next door to a wonderful coffee shop, I mean like a few steps away! Across the street is a wonderful organic grocery too! You are steps away from shopping and dining. I will definately come back!!! **For any rate below $350: This discounted rate applies for 2 guests. Add $20 per guest per night if more than 2 guests. Call owner for last minute reservation discounts! Possible exceptions for stays less than 5 nights, especially for last minute reservations.